I am 3 days in so far and I have already felt the positive affects of adapting my diet. Not only am I down 3 lbs (I was up to 166 from all of the inflammation and slowing of my digestive tract, and I was originally down to 161), my headaches are delineating, digestion is improving(I am pooping like crazy, which for me is awesome), bloating is going down and overall I am not as fatigued. Granted, the whole process of detoxing will create some of the above symptoms to some extent. But, it is with an end in sight. Prior to this, my symptoms would only increase and somewhat exponentially because once inflammation takes over and if you don’t remove the cause, it is like a wild fire with dry tinder everywhere. She also indicates that in her extensive experience, chicken is usually very reactive for people, in all of my research and reading about elimination diets it is usually turkey that is the least reactive protein (and actually true for me as well). But, once you begin to clean things up I know that will become apparent to you what you are more reactive to as well. The main point of her book and any other resource about elimination diets is that the best foods for you are just that….BEST FOR YOU. If I eat anything coconut and love it with no adverse affects, then I tell you it is the best thing since sliced bread, and you try it and bloat like crazy…well, coconut isn’t for you! Each of us are unique with our own road maps….our own chemistry. And certain chemicals get along with one another and others don’t. So,why would it be any different in our bodies?!?!? That is why you will read how one person ate this way and lost 4000 lbs and you did the same and gained the 4000 lbs they lost, right?! Yet, I have to say with all of this, I do believe something. And I believe it very strongly. Our bodies are NOT meant to be sick. They are beautifully designed to fight off, ward off pretty much ANYTHING that comes their way. However, when we overload them with toxins (sugar…yes…sugar, GMO’s, artificial crap, alcohol, preservatives….you get the idea! ), it is just TOO MUCH. If I gave you a bucket and I said to fill it up; eventually it would fill and anything you added to it after would be overfill. No matter how you added to it, it would only fall to the ground, efforts wasted and the bucket no longer able to hold any more. Are you getting where I am going with this?? While, our bodies are amazing, even miraculous at ridding our bodies of toxins…. TOO MUCH IS…… JUST TOO MUCH. Enough of my soap-box rant. Here is the good news. Your body still wants to heal. Your body still can heal. That is what I am doing. And bone broth is my new best friend. Because my system is so overloaded, it has started to attack seemingly good & healthy foods that under normal circumstances would not bother me. 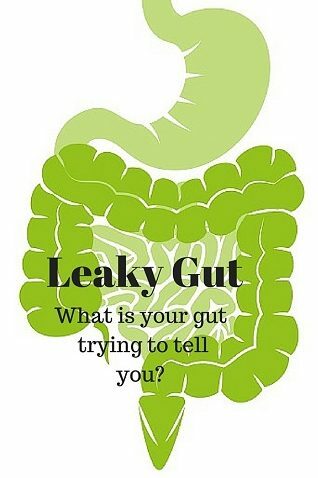 Now those foods have become public enemy number one…due to my leaky gut. Once corrected, I will more that likely be able to add many foods back in. Just ONE AT A TIME and SLOWLY over time. 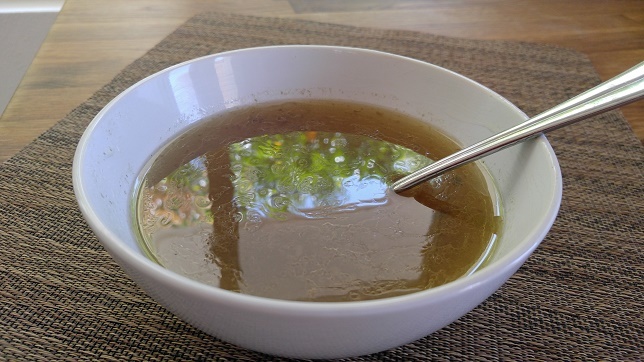 Bone broth is awesome because it is very non-reactive and easy to digest. It contains great amounts of protein (6.4 grams in just 8oz!) It also is rich in minerals that support the immune system and contains healing compounds like collagen, glutamine, glycine and proline. It also heals the guts lining and reduces intenstinal inflammation. I have included how to make your bone broth. It really isn’t hard, especially if you have a crock pot! I have one, but in the middle of making a batch, it busted and leaked all over. Nice. Thanks to my wonderful daughter she just quickly switched over to a different pot and did it the traditional way on the stove top. I wish you better health. It is possible. It really is!!! !